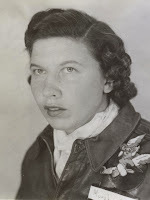 WASP Catherine Ann Murphy passed away on Sunday, January 29, 2012. Catherine was born on December 8, 1916, to Edward and Catherine Murphy, in St. Paul, Minn. She graduated from high school in Minneapolis and immediately went to work. In the fall of 1942, she went flying for the first time with an instructor named Hank, and from that moment on, she was obsessed with flying. She soled in 7 1/2 hours off a grass strip, and as she continued flying, she learned of the Army Air Forces flying training program. She applied, and when she was accepted into the class of 44-W-1, she paid her way to Avenger Field to learn to fly 'The Army Way." After successfully completing the seven months of training, on February 11, 1944, Catherine and 48 other young women pilots from her class (of 101) graduated . Her class was the first to graduate wearing the official 'Santiago Blue' WASP uniform. Catherine's official Army Air Force orders sent her to Gardner Field, California, where she flew as an engineering test pilot. From Gardner, she was sent to Randolph Field, San Antonio, Texas, where she completed basic instructor training. She returned to Gardner as a basic training flight instructor and ferry pilot. She remained at Gardner until the WASP were disbanded. After her service as a WASP, she was hired as an instructor at Western and Compton Airports, California. She sold her '42 Buick, bought a Stinson SR-5, and began a charter service, flying passengers from Los Angeles to Albuquerque, and Kansas City to Minneapolis. Eventually, she sold her Stinson and went to work for the City of San Gabriel Valley, California as City Treasurer. Catherine organized the California Municipal Treasurers Association, which eventually grew to become the Municipal Treasurers Association of the US and Canada, and was also a director on the Board of the League of California Cities. She eventually became City Treasurer and Chief financial officer for the city of Arcadia, Calif., where she worked for 27 years. In 1972, Catherine rekindled her love of flying, flying a Piper Arrow to the WASP Reunion in Sweetwater, Texas. From that flight, she renewed old WASP friendships and ‘took to the skies’, flying to WASP reunions and spending vacations flying in Arizona, Colorado, and even Alaska. In 1979, she joined the Civil Air Patrol (CAP)and became a Mission Pilot, flying search and rescue missions. She later went on to become Squadron Commander and Finance Officer for the California Wing of the CAP and Mission Coordinator/Mission Control Officer. During her active duty time with the CAP, she was the designated person for the Air Force to contact to organize all search missions in the State of California. She searched for missing aircraft, flew cadets on orientation rides, transported emergency services personnel, transported dog teams for missing persons searches, and flew missions for the Customs Services and Drug Enforcements. 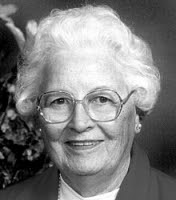 From 1984 to 1986, Catherine served as Treasurer of the National WASP organization. Her proudest accomplishment was transferring all the WASP records from paper to computer. She remained vigilant, making sure newsletters, and records, and the official WASP Roster was current and accurate. Catherine met the stiff requirements for the UFO's, "United Flying Octogenarians." (Current FAA physical, current biennial and a solo flight after turning 80) She spent her last few years volunteering with AARP, doing income taxes for the elderly and volunteering for the Community Service Unit. In 2005, she moved to Jacksonville, Oregon. Catherine was preceded in death by her parents, Catherine and Edward Murphy; brothers, Edward Murphy, and Roderick Murphy; and sister, Marquerite Veady. She is survived by her sisters, Patricia M. Paulsen, of Mariposa, Calif., and Fidelis Powers, of Sweetser, Ind. ; also numerous nieces and nephews. Mass of Christian Burial will be held on Saturday, February 4, 2012, at St. Joseph's Catholic Church in Jacksonville, Ore., at noon. Catherine Murphy was a 'doer'. She was always involved, busy, and willing to work hard to make a difference. She used her talents for finance and flying-- for leadership and service. What a legacy for such an extraordinary woman-- a WASP of WWII! God bless her family and all those whose lives she touched. ZIMMER Leona Golbinec Zimmer passed away on Wednesday, February 22, 2012 at Orchard Villa in Oregon, Ohio. She was born on August 16, 1920, the fourth child of Anna and Joseph Golbinec. She graduated from Rossford High School and then from Bowling Green State University. In 1942 she volunteered and served as a *Women Airforce Service Pilot, a cadre of 1,074 women who ferried aircraft, tested the planes that had been damaged and then rebuilt, and trained male pilots. Though they were not considered to be in the military at the time, the WASP were recently awarded the Congressional Gold Medal for their service and contribution to the World War II effort. After the WASP disbanded Le returned to Rossford and taught at Eagle Point School. Her teaching career took her to California, to Hawaii, and then to Venezuela. There she taught the children of families working for Texaco and met and married an engineer, William (Bill) Zimmer. They lived in Venezuela and Argentina until 1966, when Bill died suddenly. She returned to Rossford and worked for the Lucas County Department of Vital Statistics until her retirement in the 1970s. As a retiree she volunteered as a Precinct Worker on election days, at WGTE (Toledo's PBS station), and at the VA hospital. She was active in the American Legion and served as president of the Legion's auxiliary. She enjoyed traveling to the biannual WASP conventions as well as to Australia, Japan, Europe, and to visit family and friends all over the United States. Leona's brothers, Joseph and Albert Golbinec; predeceased her. She is survived by her sister, Margaret Golbinec Cameron; her sister-in-law, Barbara Golbinec (Al); nieces; nephews, and cousins. The cousins especially want to recognize and thank Lee Wagner (Leona's namesake) for all her care, efforts, and attention to our Auntie Le. Auntie Le had no children but she touched the lives of each niece and nephew and those of the many children in her classrooms. Le was an adventuresome spirit and a classy lady. Family and friends may visit at the Sujkowski Funeral Home of Rossford, 830 Lime City Rd. on Sunday, February 26, 2012, from 1 to 4 p.m. where a prayer service will be held at 2 p.m. with Rev. Kent Kaufman officiating. Interment will be private. 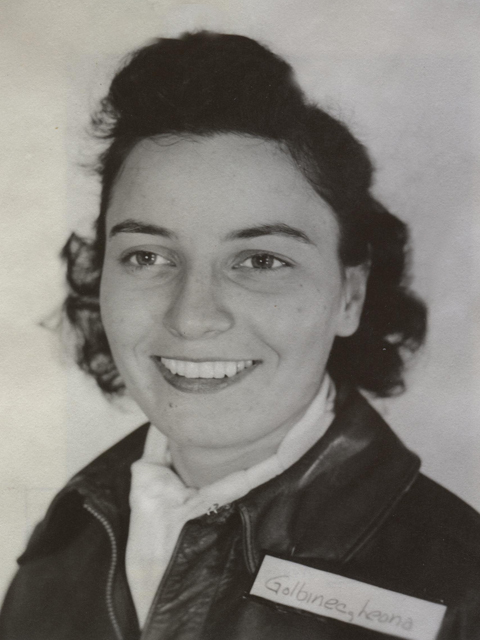 * Leona was a member of WASP class 44-W-2 and, like all 112 trainees in her class, paid her own way to enter the Army Air Forces flight training program at Avenger Field in Sweetwater, Texas. After seven months of flight training, she and 41 of her classmates graduated on March 13, 1944 and became WASP, Women Airforce Service Pilots. Her official Army Air Force orders sent her to Napier Army Air Base in Dothan, Alabama, an advanced training base for cadets. At Napier, she would have flown At-6's as an engineering test pilot, making sure planes that had been 'red lined' were fit to fly. She might also have ferried PT'17's and AT'6's and flown administrative missions. She remained at Napier until the WASP were disbanded on December 20, 1944. Like every woman pilot serving, she then paid her own way back home. Leona's participation as a WASP during World War II freed male pilots for combat duty and helped our country at a time when we were desperate for pilots. What a glorious legacy she leaves. Our thoughts and prayers are with her wonderful family and all of those whose lives she touched.